After taking photos and enjoying the views of the popular McWay Waterfalls and the seaside, it was time for serious hiking. We head back towards the tunnel under CA-Highway 1 and continued to the Julia Pfeiffer Burns State Park parking lot. I moved my car to the other side of the bridge and parked close to the picnic tables where we stopped to eat lunch of pita bread, hummus and fruits. With renewed energy and refreshed with plenty of water, we were off. We followed the path right along the creek with big rocks and boulders (It was probably a river at one point, but now I noticed the effect of the drought in the low water level and slow river flow). We continued to walk the trail along the creek. It was quite pretty. My hiking companions crossed the shallow creek, and scrambled on the rocks to avoid getting wet. I, on the other hand, tried to show off my skill (acquired from practicing yoga) on the log bridge and crossed the river by skipping through boulders. Shortly after crossing the creek, the trail forked in two: Canyon Trail and Ewoldsen Trail. We first hiked Canyon Trail and cut through a redwood forest. The ground was covered in shrubbery: California black berries, nettles and ferns. The narrow and uneven trail was littered with fallen branches. It felt as if we were walking through an obstacle course. We decided to go back and hike the Ewoldsen Trail instead. 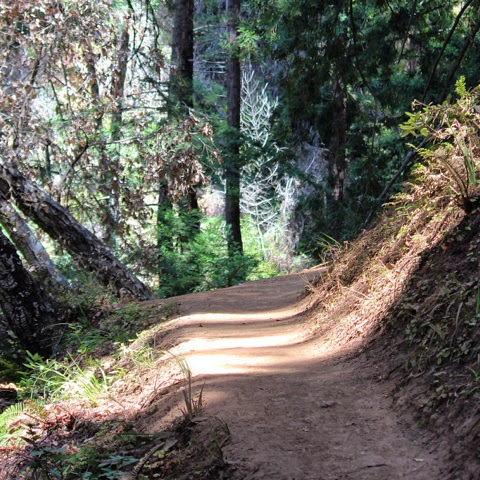 The trail passed through countless of coastal redwoods, and continued at the rim of a steady sloped canyon that stretched into the hills for a few miles, forming a multi-tiered hiking path. It was a very steep climb. I looked down at the bottom of the canyon and saw other hikers looking like little figurines along a cliff up the stream. The trail continued into the hills even farther and one of my hiking companions was insistent on scaling the mountain by climbing over the fallen trunk that blocked our way. The trail continued to a bridge that joined the trail to the other side of the canyon. We saw a family congregating at the foot of the bridge, seemingly trying to make a decision whether to continue their hike at the other side of the canyon. The mother, who was inspecting a map, informed us that the trail across the bridge was steeper and it would not loop back to where we started. She was not kidding! The hike back was as bad as the way up. Being a dry dirt path, it was dusty and slippery. I almost slip at one point when I saw the blue sky through the trees and a glimpse of the ocean and stopped to take pictures. When we reached the bottom of the canyon, I noticed the bounty of nature. I saw an ancient redwood tree with trunks going in different directions, a lone redwood tree surrounded by a green meadow, and some blue reed grass up on the hill. I could have done my photography before hiking, and the camera would have been one less load on my back, I thought. As I sat to rest my tired feet, stellar jays darted from the trees to give us company. The place possessed a feeling of tranquility to uplift our spirits after returning from a hard day of hiking.